William Percy, 28, is nearing the end of his first year as a business studies and ICT teacher at Alsager School in Cheshire. His story is one of determination in the face of discrimination, as well as of a school willing to listen and be challenged. "When I first started applying for teaching posts, I was getting refusals, no interviews, no nothing," said Mr Percy, who has used a wheelchair following a parachuting accident nine years ago. "Some heads would say: 'How can you teach from a wheelchair?' It was getting me down. I felt I was wasting a lot of time and getting nowhere." When he applied to Alsager School though, the attitude was very much "apply and if you're the best candidate, you'll get the job". Mr Percy did prove to be just what Alsager School was looking for, with a first-class honours degree and a postgraduate teaching certificate from Staffordshire University, as well as a doctorate underway in enterprise education - something the government is keen to expand. 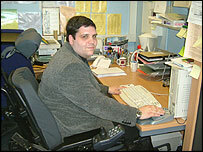 He wrote the school's application for pathfinder status, where schools are given a remit to develop enterprise education. This is worth £50,000 to the school over two years. This status also proved to be "a big tick in the box" when the school went on to apply - successfully - to become a business and enterprise specialist school from next September. Having joined the armed forces as a paramedic at the age of 18 after completing his A-levels, William also came with a rich experience of life outside the education world. "The benefits he brings to us greatly outweigh the costs, in my view," said the head teacher, David Black. Of course, certain physical adaptations have had to be made to the school, such as an automatic front door and an ICT-rich classroom where William can download his lessons onto an interactive white board rather than having to write on the board himself. He also has a support worker who helps him in the classroom, for example by handing out work, and with routine tasks such as photocopying. But funding has come forward from various sources, namely the local education authority, Access to Work and the Shaw Trust. "On the scale of things I have to deal with, this is nothing much. Redundancy, permanent pupil exclusion and staff disciplinary are far greater problems," said Mr Black. "I saw Will as an opportunity - the challenges that came our way were barriers to be overcome, not obstacles." And certainly there have been challenges. It would be wrong to suggest William Percy's first year has all been plain sailing. For example, David Black was keen to make adjustments so he could be expected to carry out all tasks for teachers, including exam invigilation. But Mr Percy felt that this merely highlighted his disability by putting him in a position where he could not carry out the task fully. "I'm not at the right height, so I can't see what's going on, I didn't feel the noise of my chair was fair on pupils, I need to go to the toilet more often so might have to leave the hall and I just didn't feel comfortable with it." He had to learn to tackle the problem without expecting antagonism as on previous occasions. As David Black puts it, he was "kicking down an open door". "It's not just the school that has to make adjustments, as a disabled person you have to too because you do carry baggage," said Mr Percy. "The deal is that I do more extra cover over the exam period, so it's give and take." Back-up from his union, the Association for Teachers and Lecturers, also helped smooth over misunderstandings. Where are all the disabled teachers? The Teacher Training Agency says 4% of the 40,000 people due to start teacher training courses this autumn declare themselves as disabled. 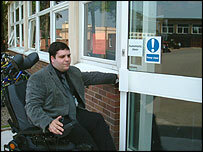 But Mr Percy often feels alone in the teaching profession, certainly as a wheelchair user. So why are there not more teachers like him? "My own personal theory, and it is only my theory, is that a lot of disabled people go through education and suffer discrimination. So why would they want to go back into education and teach?" he said. He is an ardent supporter of the education department's inclusion agenda. "It's very important to integrate people and to reflect our society, because if you ghettoise any impairment or disability, then it just leads to more discrimination. "I can see why special schools exist, but I agree with the government policy of inclusion." 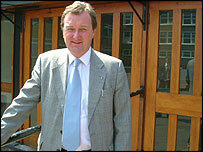 Head David Black said Mr Percy had helped break down barriers at the school. "We're being encouraged to be inclusive - how can you be inclusive for students and not for staff? "The place is richer because the diversity is there. It's good for the children to see there are disabled people in society who are good at their jobs." And two of his 14-year-old pupils back up this view. "He's just a normal teacher," said Hannah. "It doesn't stop him from teaching us," added Kathryn. "He's got that goal that this is what he wants to do and he hasn't let things stop him. It makes me see I'm lucky."